The Society of Crystallography for Australia and New Zealand (or SCANZ) have a great history of holding our national meetings in rural (regional) locations. Known as the CRYSTALS meetings, past conferences have criss-crossed though the Australian continent as well as making a couple of trans-Tasman trips to New Zealand http://scanz.iucr.org/events. It has been realised that having our meetings in regional locations gives SCANZ a fantastic opportunity to hold outreach events promoting crystallography to audiences who get little in the way of public science events. Australia and New Zealand have highly urbanised populations (75 % of Australians and 85 % of New Zealanders live in cities) and are treated to a large range of science events. However, those that live in regional areas don’t have such ready access to such events and are often a ‘missed out’ audience. With SCANZ’s history (we started out as ‘Bush Crystallographers’) and the fact that we bring some great international and domestic invited speakers to our meetings, through schemes like the 1987 lecture fund, there is great opportunity to hold public science events in the regional locations of our national conference visits. 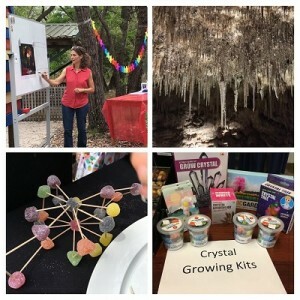 With that in mind, and that our CRYSTALS 31 https://crystal31.com/ meeting was being held in the wonderful Margaret River area, we organised our first public outreach event in conjunction with the conference. ‘Science at the Caves’, was a mini-science festival held at Ngilgi Caves https://www.margaretriver.com/members/ngilgi-cave/ just before the conference kicked off on the 3rd December. With the aim to explore the connections between crystals and caves, we had talks from invited speaker Ulrike Troitzsch (Australian National University) on her coral research (the starting story for calcium carbonate) as well as Andre Courtis a local cave guide. As well as hands-on activities demonstrating crystallography to everyone. Supported by the conference chair and SCANZ executive, the hope is now for each future CRYSTALS meeting to have a public outreach event and to build up sci-comm expertise in the crystallography community.